Spring Into Home Safety | SafeT Systems | Easy. Enjoyable. Secure. Having to do yard work again may be one of the only downsides to spring; but it is also a very easy way to deter unwanted visitors. If you’re in the market for new greenery around your property, think about planting prickly shrubbery below your first-floor windows. Existing plants should be trimmed back and kept full, yet compact, because unkempt landscaping serves as a tempting hiding place for burglars. Keep tree limbs and branches trimmed to an appropriate length so they cannot be used to climb over a fence or onto a patio or windowsill. Believe it or not, a fence can often be the deciding factor between a burglar choosing your house or the next. If you don’t have a fence around your property, maybe it’s time to consider installing one. If your property does have a fence, check it’s condition. A harsh winter can split and rot wood, and rust even the sturdiest metals. Give your tired-looking fence some TLC, and you’’ll be glad you did. Many of us are very conscious of locking our doors when we leave the house, but the reality is that the most common point of entry for criminals is the front door. Take the time to invest in a deadbolt lock with a heavy-duty strike plate and mounting screws at least 3 inches long to ensure the safety of your home and guaranteed peace of mind. The most useful trick against burglars is to make them think you’re home. 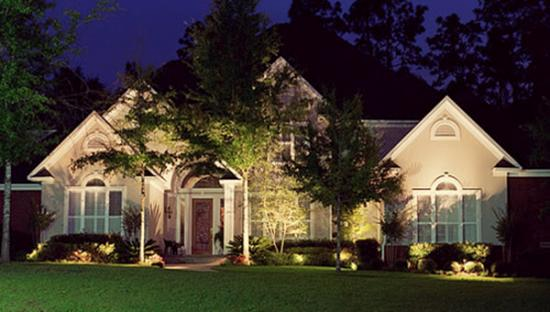 While we’re not suggesting you keep your lights on throughout the night, investing in energy-efficient fluorescent bulbs for outdoor landscaping lighting is a great option. Next time you drive around your neighborhood at night, check to see if your home’s street numbers are clearly visible so that any emergency vehicle could easily locate it. If not, any hardware or home improvement store has many different styles of reflective numbers which can ensure a faster response in a true emergency. DIY home alarm systems are great because they are relatively inexpensive, and you get features that fit your needs. The downside of this depends on what you’’re looking for to be protected, and your own physical capabilities of installing a system yourself. Shopping around and doing a little research could give you more options than you may have originally thought. If you decide to invest in a professionally installed system, make sure you choose a reputable brand of equipment, and a company that will properly install it.